When Nintendo announced Fire Emblem Echoes, I was delightfully surprised to see that the West would finally be able to experience a supposed classic of the series for the first time. It is clear that Nintendo put a lot of effort into balancing both staying true to the original game, and touching up some elements to make it more appealing to a modern audience. The game features some intriguing departures from key aspects of the overall series. As a result, there are some elements that I wish to see in future releases. However, when compared to other Fire Emblem releases, Echoes seems marred by antiquated design choices, and is worse off for it. If there’s one feature that I sincerely hope all future Fire Emblem games shell out for, it’s having a fully voiced game. Brilliant actors like Doug Erholtz, Keith Silverstein, and Cherami Leigh steal the show while bringing out their respective character’s personalities. Even simple town NPCs have fully voiced lines, which helps make the world of Valentia seem more alive and interesting. Furthermore, during cut-scenes there is now an option to let the game control the flow of dialogue. Instead of having to press a button to push a scene forward, the game allows for more natural pauses between lines, which helps characters sound like they are having an actual conversation. The introduction of Mila’s Turnwheel is somewhat divisive for Fire Emblem fans. The system allows players to rewind battles back to a point of their choosing, up to a certain number of uses for each battle or dungeon. I cannot stress how incredibly powerful such a system is, as it negates one of the key issues I had when playing Fates: Conquest. Namely, it allows players to undo extremely poor RNG, like a 3% critical chance from an enemy attack going off, a major final blow missing its target, or accidentally putting a unit in harm’s way unintentionally. Some fans have called this out as a betrayal to the heart of the series, that perma-death matters and should have to be accepted. While I can empathize with that mindset, as I’ve become older I’ve realized that my time has far more value than my pride. Now if I decide to take a risky gambit, I am allowed to see the result of my actions, and adjust course if necessary. This mindset of allowing players to make up for bad luck or mistakes that we’ve seen in Awakening and Fates is welcome in Echoes. Echoes changes up the promotion system of Fire Emblem in a few key ways. When promoting any unit, the next tier of class has baseline statistics that will automatically be added to the unit. For example, when Genny is promoted from a Cleric to a Saint, her Health will always go up to 30. This allows the player to not have to worry about maxing out a unit to Level 20 before promoting for the sake of statistics, as they will go up to the classes’ minimum no matter what. In fact, as a result of this, promoting as soon as possible is, in my opinion, the favorable option. Likewise, when you inevitably get a terrible Level up (only one statistic increasing), you can shrug it off as a temporary setback, rather than something that will ruin a character. This will happen a LOT, but at least now it’s less punishing. Giving players the freedom to make this decision is a brilliant choice, though unfortunately I have not been able to determine if using status boosting items or fountains before promotion carries over the benefit, or is rendered useless. Speaking of statistics, the way damage is calculated in Echoes is a 1:1 ratio between Attack and Defense (or Resistance in the case of Magic). For example, if an Archer has 15 attack and shoots a Soldier with 14 defense, that Soldier will only take one damage. This puts a huge emphasis on units with a strong pool of Health and Defense/Resistance being a core aspect of the player’s army. As a result, characters with other drawbacks like low movement or poor Attack stats may still end up on your roster, which makes for a diverse cast of classes that get to see battle. Likewise, the Weapon Triangle, a core aspect of the series, has been removed. Players instead are tasked with choosing one item for each unit, whether it be a weapon, a shield, or some form of utility item. Early on in the adventure, the Defense provided by shields can be critical to ensuring a successful advance of units without being overrun by counter-attacks. At the same time, enemies who possess such items will require multiple attacks to take down. This basic Silver Lance almost doubles Clair’s attack! In the later chapters of the game, the bonus abilities and stat increases of powerful weapons allow units to start unleashing massive damage numbers that seem more in line with recent Fates or Awakening systems. While units are able to swap items at any time, they are only able to use the abilities of the item they currently have equipped (and have unlocked through subsequent use). In the late-game, it is worth taking the time to unlock the powerful abilities that certain unique weapons and shields have. Those who have played newer Fire Emblem titles like Awakening and Fates will recall various areas that allow players to upgrade weapons. Echoes takes this a step further, and allows the player to both upgrade a weapon’s statistics and evolve it into something new entirely. Player’s can take a standard Iron Lance and upgrade it through Steel, Silver, and eventually into a truly fearsome weapon with powerful abilities. There are some disappointments, as you cannot level up shields or utility items for some reason. Even so, the way Echoes approaches forging itself is neat, and it allows players a lot of agency in how they want to outfit their units. If you enjoy a sense of mystery, evolutions are kept hidden until unlocked. 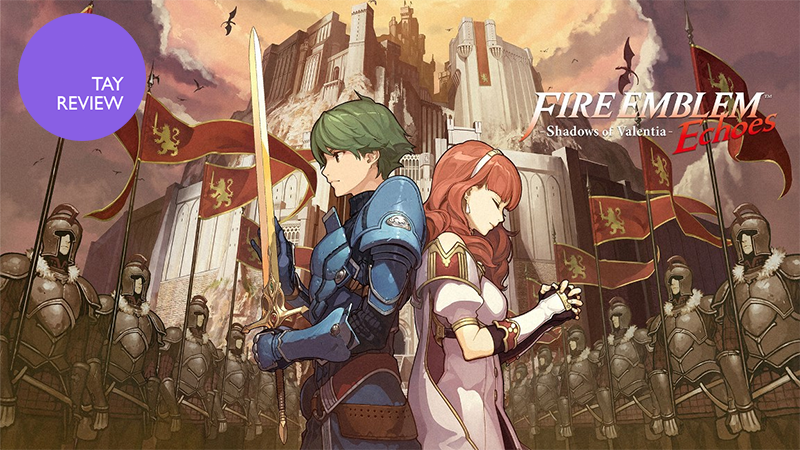 The story of Echoes revolves around Alm and Celica, two childhood friends who are both fated to save the world. For some, journeying to Valentia will be a call-back to older entries in the series like Fire Emblem: Blazing Blade, where political intrigue and revolutions were core aspects of the story. The plot contains little fanfare and optimism, favoring instead a story much like Fates: Conquest, with tragedy befalling both heroes multiple times. In fact, much like Awakening, the very start of the game opens up with quite the dark cliffhanger. While I do not want to go into specific spoilers, the overall narrative mixes a blend of two star-crossed children who are both thrown into extrodinary circumstances. Alm will lead a ragtag group of knights and villagers alike, hoping to overtake a newly bequeathed tyrant, while Celica sets off on a journey to save the very continent itself. The primary issue with both of their stories is pacing. The first chapter of the game, while familiar in setting, is very slow. Likewise, the final chapters of the game are a mix of rapidly escalating scenarios, insufferably long battles, and very questionable character decisions. Only the middle chapters seem to have a nice balance of lenience and urgency. If you are a fan of medieval fantasy, the story of Valentia will likely be acceptable enough, but it isn’t quite the grand narrative it aspires to be. At various points in the story, both armies will be tasked with delving into ancient ruins, mountains, or temples. In a great change of pace, players are given direct control of a three-dimensional Alm or Celica, and are able to dash about pathways attacking ghostly phantoms, terrors, or bandits. Initially, this mechanic is a fun departure from the standard battle systems, but unfortunately it seems to still be in its infancy. Dungeons are rudimentary, containing obvious “hidden paths”, and tend to be very narrow in design. Upon coming in contact with an enemy, a standard battle will take place. If multiple enemy spawns are close enough, they will join each other in combat. As a result, what may seem like a basic fight can suddenly turn into a huge gang up, even if the player is unable to see the enemy spawns in the dungeon initially. The primary issue is that these battles are completely inconsistent, varying in ranges of difficulty from absolutely trivial to unexpectedly impossible. Throughout my play-through I was either choosing an AI-controlled option to blaze through small-fries, or meticulously trying to circumnavigate overwhelming odds. Rewards for completing dungeons do add up quickly, as often they are the only nearby method for obtaining unique weapons and shields, or promoting units via Mila’s Statues. Fountains that increase various statistics are also available, though in limited supply. This is a personal nitpick, but Echoes feels like a step backwards from the incredible musical accomplishment of Fates. I deeply miss having the seamless transition of music from battle maps to individual engagements, and how melodies would roar out and them calm down as a result. Having to hear the exact same battle music, over and over from the beginning with each engagement gets stale quickly by comparison. The rest of the soundtrack is met with varying degrees of success, but unlike Awakening or Fates, there wasn’t a single track that I could individually point out as fantastic or memorable. Perhaps that is the choice of the composer, instead choosing to let the dialogue take the main stage and let the music simply be an accompaniment. For all of the folks seeking romantic engagement of waifus and husbandos, I have some bad news: Echoes completely nixes custom romance and children. Some pre-determined marriages will certainly take place, but the player has no agency in playing matchmaker. While this does make the characters seem more human, and quite frankly believable, it also removes a feature that quite a lot of people enjoyed. Granted, Echoes is a remaster, so I can see why they didn’t want to disrupt the already established plot. I just wish the Support conversations were more interesting or varied. Quite a lot of them tend to essentially boil down to “leave me alone, I’m busy fighting” initially, and only a sparse few are interesting, funny, or memorable. Some involve characters pining after others that they clearly know they can’t have, which comes across as almost stalker-like. Overall, the Support conversations feel grounded in reality, but also dull and hollow as a result. One of Echoes biggest failings is, quite frankly, that it is boring to exist in. There are countless battles that take place in a basic forest, an open plain, or as seen below, a basic river crossing. While the actual locales do eventually open up to involve oceans, deserts, and chilly mountains, the battle maps themselves end up being incredibly basic. Eventually, some dungeons and key battles do add elements of complexity and creativity in their design, but the vast majority of battles tend to be one-note and otherwise forgettable. To make matters worse, at multiple times throughout the game, Valentia will throw waves of enemy squadrons at the player via the Overworld Map. There are multiple aspects that make this very annoying. First, should the enemy squadron encounter the player, rather than the player engaging them, they will automatically begin the battle going first, and the player is not given the chance to organize their unit’s layout on the map. This can result in some horrendous disadvantages, though I never once encountered the AI completely killing a unit on that first turn. Secondly, the waves do not stop until the player reaches the main army that is causing the squadrons to spawn. If you want to go back to a village or temple a few points away from your current location, you can expect at least two squadrons of enemies to be newly spawned by the time you get back to your original position. It is needless padding and it is maddening. Lastly, should the player choose to be more offensively oriented on the map, if they engage what would be an otherwise normal chapter of the game that also has a spawned squadron on top of it, the player has to face both armies at once. This ends up bogging down progression to a crawl during some chapters, as the player ends up doing a needless dance to avoid unfavorable conditions with the spawns. If you want the complete experience of Echoes, you are going to have to pay for it. Backstory to some of the major events of the plot are locked behind DLC, and unfortunately some characters feel needlessly one-note in the basic game as a result. Possibly even more egregious is the cost of being able to level up and improve weapons reasonably. Past level 10, for most parts of the game, experience will slow down to a very minor crawl. While in the early game this is resolved by promoting units to level 1 of a new class, in the later portions of the game grinding becomes essential to match either the large number of enemies, or the incredible power of a few key bosses. Without DLC, this would require players to either engage in endless spawns of enemies, or go into the same dungeons over and over for experience. What is insane is that, even with the DLCs for experience grinding, the level of difficulty the enemy units represent in the higher-tier of the DLC is quite high for mid-game units, while the experience given from victory is frustratingly low for late-game units. Essentially it manages to ride the perfect line of being too hard to use when it is most needed, and needlessly slow once you’ve reached the late-game. Instead, I found myself using the Silver and Gold generating DLCs the most. Though I do quite love the ideas and choices the Forging system allows for, unfortunately upgrades become very expensive later on. Some require the use of Gold, which is far rarer than Silver. Though you can trade in 500 Silver for 1 piece of Gold, the exchange rate rarely seemed worthwhile, as both currencies are needed in large supply. Luckily, the lower-tier of the currency generating DLCs is very easy, and gives a reasonable reward. Though I initially was hesitant to do so, eventually I broke down and used the automatic AI battle option to grind the map quite a few times. Between the options of grinding forever in dungeons or picking up the pace via the DLCs, I chose the DLCs, because one way or another grinding is required, especially if you want to beat the game with no casualties. I should note that I was supplied a Season Pass by Nintendo, so whether or not spending the extra money is worth it is going to vary per person. Finally, if you were curious about Amiibo support for Echoes, it is underwhelming. Alm and Celica’s Amiibos open up unique dungeons that contain some powerful loot, but nothing that is far superior to what you can find in the normal game. In battle, you can summon various heroes like Marth, Roy, Lucina, or even copies of Alm or Celica. Unfortunately, doing so costs health, and the unit only lasts for one turn. At very key points in the game, being able to call for unexpected help (or a distraction) can be vital. Similar to the DLCs, it is up to the individual to determine if it is worth the price of admission. Though I will say they do look great! For transparency, Nintendo did supply me with both an Alm and Celica Amiibo. Some aspects of Fire Emblem Echoes: Shadows of Valentia shine brilliantly. There’s always some risk with departing from main aspects of previous titles, and to a degree that risk is paid off with equal reward. Unfortunately, very poor pacing and uneven difficulty spikes, combined with the necessity to grind meager experience gains, results in a game that feels like it is trapped in antiquity, despite being a remaster. Rer is a small-time YouTuber and Streamer who enjoys writing #FeelsGoodMan posts about gaming. He strives each day to spread awareness of the positivity gaming can bring to ourselves and society, and hopes you’ll join the conversation. Find him on Twitter: @RerTV.